"The bats use the trees as roost and maternal sites and apparently not only use the peeling sheets to hide under but finds that shagbarks provide excellent thermal regulation. In Ontario, species such as the little brown bat (Myotis lucifugus), the silver-haired bat (Lasionycteris noctivagans), and likely the big brown bat (Eptesicus fuscus) are found using live shagbarks. 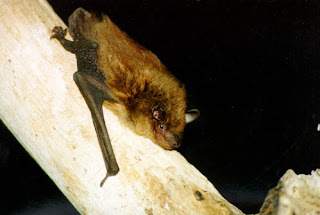 It seems clear that in forests and urban situations, the loss of dead trees with sloughing bark has lead to a decline in bats using natural roost sites. Shagbark hickories provide excellent roost sites as the bark begins to shed at 10+ years and can continue to provide outstanding habitat for two centuries or more."